See more of Shanghai in less of the time on this comprehensive door-to-door guided tour that covers the bases of Shanghai old and new. 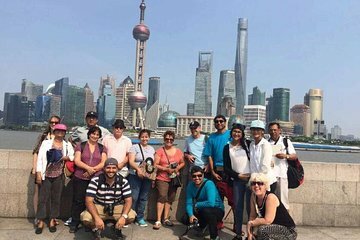 Start at Shanghai Old Town and Yuyuan Garden, stroll along the waterfront Bund promenade, see the cultural treasures of the Shanghai Museum, explore the Former French Concession, and wander Tianzifang. Along the way, enjoy a local lunch, visit a tea house, and shop Pearl City Market.